I thought I might contribute this comp to the Composition Gallery. Before I do that, I was hoping someone might take a look and advise on best practices (cuz I still feel new to Vuo). Downloads images from a website (texturelib.com), loads two images and fades between them, loads another, fades, etc. Feeds the layers to a subcomposition designed to recreate some of the features from vade's v002 Rutt Etra QC plugin. 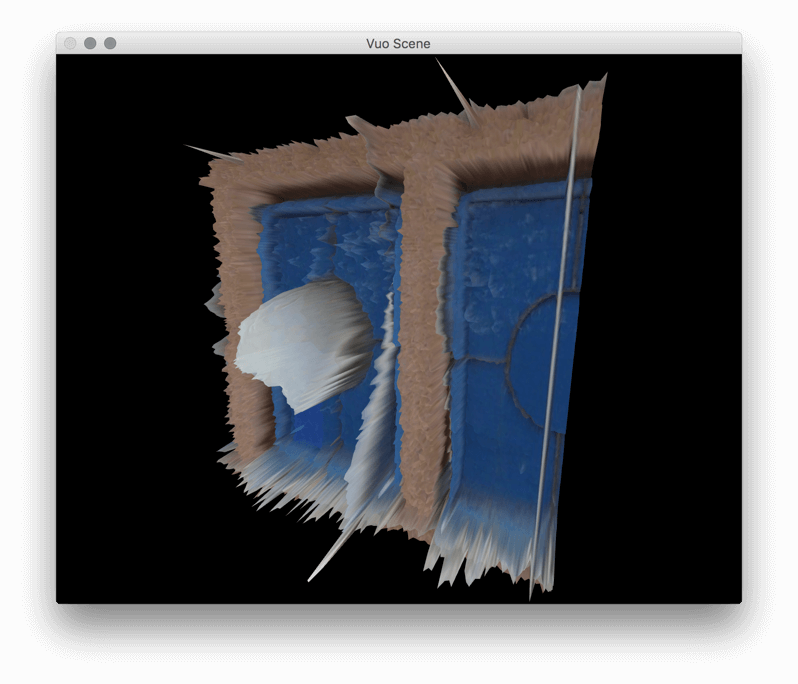 to monitor fps / hover over the Render Layers to Image then click on the popup that appears. it becomes it's own window at that point which stays open to monitor performance. I'm guessing the slow performance may be caused by too many rows/columns. Regarding the glitchy image loading, I guess I am wondering about preloading the images, esp. downloading from the internet. Maybe I should try building a list, using Fetch List of Images or something? Here's where I am fuzzy (ie, not a programmer). Also fuzzy on why fps is ~40-50 on Render Layers to Image but Draggable Camera can't keep up. Rows and columns is the clear culprit, I just want to be more clear on editor processes vs rendering process, cpu/gpu, etc. The issue this comp has when switching images feels similar to other issues I have had so far not knowing when to insert a Hold Value node. Is that the issue here? Nothing I try works so far. I have also been trying Spin Off Events (looking at the Load Image Asynchronously example composition), no luck. Any suggestions? A little progress maybe, using a Hold List after Enqueue. Still a little glitchy when images switch, though perhaps the glitch has it's own charm, considering images get processed by the Rutt Etra subcomp. In your composition, you're starting the Measure Time timer when the Fetch Image starts, instead of when it finishes (which could be a second or two later). So the composition is trying to transition images while the image is still downloading. The attached composition fixes it by (1) waiting for Fetch Image to complete before starting the timer (cable from Fetch Image to Measure Time) and (2) decreasing the transition time to reserve 1 second in each 6-second Fire Periodically cycle for the image to download (Subtract -> Curve). As you figured out above, there needs to be a Hold Value node to keep the event from Fire Periodically from sneaking in between two events from Measure Time and making the image flicker. 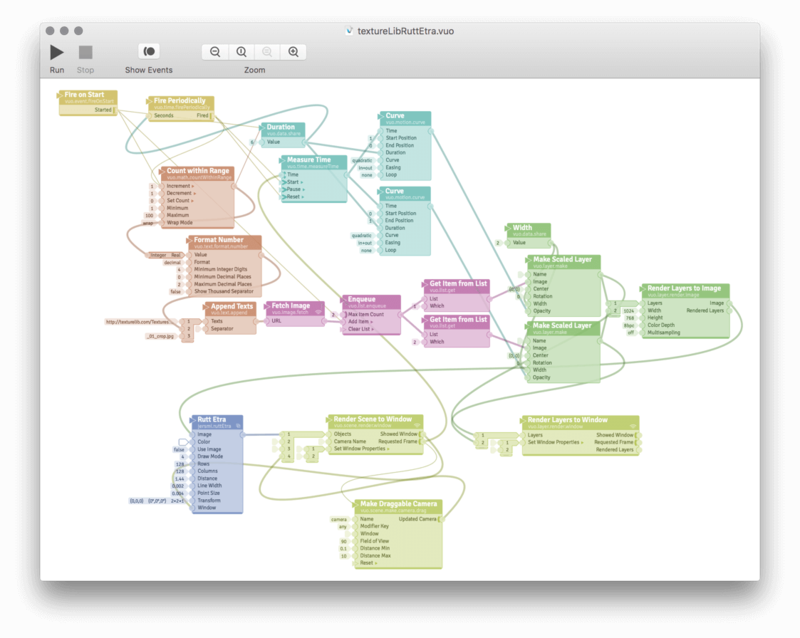 The attached composition actually adds two Hold Value nodes, to work with the above change. Ok, last questions on this, I hope. Is it possible to turn this into an Image Generator? I am hoping to make video files. (I can use Syphon, I know). I think the right question is, how can I replace Fire Periodically for Count Within Range and to get the images to fade properly? Also, is it possible to record mouse data, or do I need to set up camera animation? To replace Fire Periodically, you could connect the time published port to Snap Value -> Increased. You can record a video with mouse data (for any composition, not just Image Generator) by going to File > Start Recording in the composition's menu. If it's important to have a perfectly steady framerate, though, (or to set video recording options) then you should use Image Generator and use Vuo Editor's File > Export > Movie... In that case, you can't take mouse input, so you'll have to simulate it in your composition. Great convenience! Is there any way to change settings for CompositionLoader movie export? 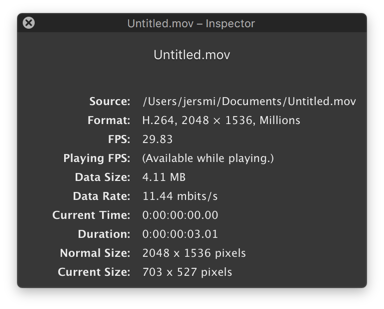 My export saved a huge H.264 movie -- looks like full screen/retina 2048 x 1536px. jersmi, that would make a good feature request.